Don’t routinely order a thyroid ultrasound in patients with abnormal thyroid function tests if there is no palpable abnormality of the thyroid gland. Thyroid ultrasound is used to identify and characterize thyroid nodules. Thyroid ultrasound is not part of the routine evaluation of hypothyroidism unless the patient also has a large goiter or a lumpy thyroid. Incidentally discovered thyroid nodules are common. Overzealous use of ultrasound will frequently identify nodules that are unrelated to the abnormal thyroid function. This may divert the clinical evaluation to assess the nodules, rather than the thyroid dysfunction. Thyrotoxic patients with nodules may also benefit from imaging. For these patients, a thyroid scan is used to assess the possibility of focal autonomy in a thyroid nodule, and correlated with the ultrasound findings. In some centers assessment of thyroid artery blood flow by doppler may be used to help distinguish Graves’ disease from a destructive thyroiditis. Members of the Endocrine Society (Society) along with representatives of the American Association of Clinical Endocrinologists (AACE)* formed a joint task force to identify tests or procedures which should only be used in specific circumstances. The task force identified several items for possible inclusion. Subsequent discussions compared the evidence supporting each item, the value of the recommendation to practitioners and the potential for cost savings. Members of the Society’s Clinical Affairs Core Committee and AACE leadership also reviewed the initial list. Using the above criteria, the task force voted for their top five recommendations from the original list. The Society’s Council and AACE’s Board of Directors approved the final list for submission to the Choosing Wisely® campaign. The Endocrine Society disclosure and conflict of interest policies can be found at www.endocrine.org. 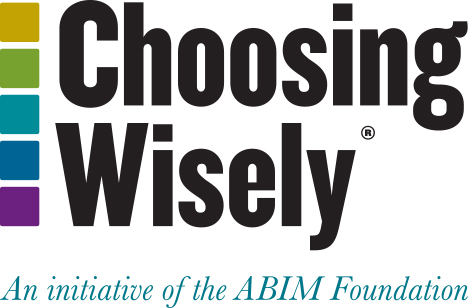 *The American Association of Clinical Endocrinologists withdrew from the Choosing Wisely campaign on May 26, 2015. Bahn RS, Burch HB, Cooper DS, Garber JR, Greenlee MC, Klein I, Laurberg P, McDougall IR, Montori VM, Rivkees SA, Ross DS, Sosa JA, Stan MN; American Thyroid Association; American Association of Clinical Endocrinologists.Hyperthyroidism and other causes of thyrotoxicosis: management guidelines of the American Thyroid Association and American Association of Clinical Endocrinologists. Thyroid. 2011;21:593–646. Garber JR, Cobin RH, Gharib H, Hennessey JV, Klein I, Mechanick JI, Pessah-Pollack R, Singer PA, Woeber KA. Clinical practice guidelines for hypothyroidism in adults: cosponsored by the American Association of Clinical Endocrinologists and the American Thyroid Association. Endocr Pract. 2012; Sep 11:1–207.